It's common to see reports of how the average house price has increased in relation to average income over the past decades, reducing home affordability to the point where the dream of becoming a home owner is out of reach for more and more working families. But the use of average figures can distort the true picture - after all, there are plenty of houses for sale below the average, but they tend to also be in cheaper suburbs where the average income is lower. 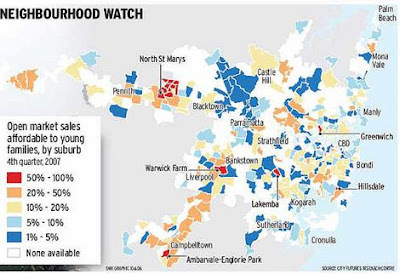 So how do you know which parts of Sydney are truly unaffordable? City Futures Research Centre at the University of NSW has attempted to provide a more realistic measure of housing affordability in Sydney by comparing average house prices in each region with average income data for that particular region. Most people buy their first home within a short distance (5-10 km) of where they're living at the time they decide they want to buy. While this is an interesting way to look at affordability, it doesn't speak to which areas are good value. After all, an area with expensive real estate will tend to be populated with high income families (who are the only ones that can afford to live there), and so may appear to be relatively affordable according to Randolph and Pinnegar (the authors of the report), but may still be overpriced.